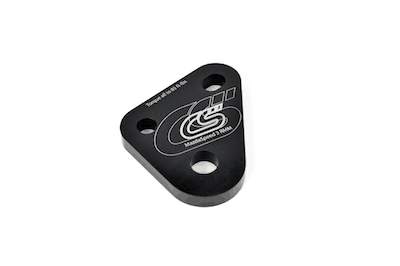 The CorkSport Stage 2 Rear Motor Mount is the latest and greatest design for the car enthusiast. The "think-outside-the-box" design takes a new look at the RMM design for a no-compromise goal of style, performance, and refinement. The CorkSport RMM significantly reduces wheel hop, torque steer, and improves throttle response by securely controlling your engine’s movement. The design achieves this with a minimal increase in engine noise, vibration and harshness (NVH); seriously it’s impressive how smooth the CorkSport Stage 2 RMM is and our beta tester agrees. Check out the video below to see the CorkSport Stage 2 RMM in action and get all the details below. #ZoomZoom! Relocating the polyurethane bushing further forward on the transmission improves the control the RMM can provide to the engine while adding minimal NVH to the driver. With this design the polyurethane bushing could also be orientated in the correct direction to better control and isolate engine movement and vibration. Check out the design blog for further details and an explanation of the design. The RMM primarily controls the engine's rotational forces in the engine bay. These forces are a result of acceleration and deceleration via engine braking. With the OEM RMM the engine is allow to move/rotate significantly before force is finally applied to the tires; this is the major cause of wheel hop, torque steer, and poor throttle response. The CorkSport Stage 2 RMM significantly reduces the engine’s rotation movement, thus greatly decreasing all the issues mentioned above. As with any performance RMM, you should expect an increase in NVH. However, with the CorkSport Stage 2 RMM the compromise you have to make is small. Beta testing has shown only a small increase in NVH on cold start-ups and off-throttle RPM ranges. Testing has shown very minimal NVH increase above 2500rpm. The CorkSport Stage 2 RMM uses 6061-T6 aluminum for the "I-Beam" style brace bar and the ½" thick mounting plate for its high strength to weight ratio. These beautiful CNC machined parts are then anodized for a long lasting finish. The RMM performance is locked down with 95A polyurethane bushings, zinc-plated steel sleeve, stainless steel bushing washer, and the necessary hardware. Produced in America: Designed, Manufactured, and Assembled in Vancouver, Washington, in the Pacific Northwest. 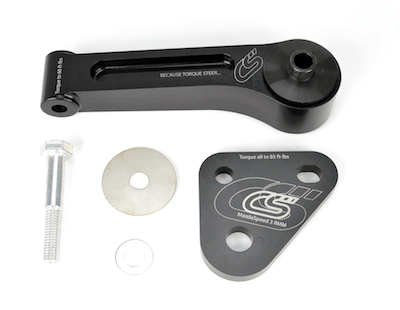 It will take you two hours to install the CorkSport Stage 2 Rear Motor Mount with our easy-to-use instructions. Disclaimer: NVH (noise, vibration and harshness) in the cabin of your vehicle will be increased by the installation of this engine mount. Super easy install, and you’ll definitely know you put a this bad boy on. Instructions were flawless as always. Don’t bother with any other mount, this is everything you want and the price is perfect. One of the first modifications to my car and probably my favorite so far. I've put about 15k miles on the car since. The part itself is a beautiful design and you can tell the quality when you first take it out of the box. Install was easy and confidence boosting to continue new part installs on various areas of the car. I didn't notice too much of noise increase in the cabin and was mostly aware of the performance upgrade and how much more planted the car feels through acceleration. Just out this on and got back from the first drive. And I absolutely love it. The shifts are very crisp and solid. Tested a hard take-off from 5mph and never had any troubles slamming through the gears. The front end feels like it's more solid and not moving around as much. Only downsides is it is Extremely loud and the whole car vibrates. However, i've had it on probably 30 minutes and went for a 20 minute drive so it still needs to break in. Will update in about a week. Absolutely LOVE this motor mount! I've had it on for about a week now and I can really feel the difference. I shift smoother without feeling the engine moving around, it feels like all the power is getting through to the wheels now, and the front end just feels a bit more solid altogether. the Noise Vibration and Harshness (NVH) was pretty significant when I first installed the mount and for about the next 2-3 days. After about a week, it's broken in well and the NVH has gone down a bit. It made my car a little louder too, not sure if that's vibration noise or the exhaust noise not being absorbed by the soft stock mount anymore. one of my best purchases for the car!! Let me tell you what. This mount is the most unbelievable thing you’ll ever put on your car. I had a previous competitors mount and that mount vibrated my car way more than I thought it did. A/C kicked on and the whole car was giving me a massage. But this...this mount has the least amount of NVH I could think of as far as a higher performing mount goes. I turned my A/C and it was quiet..no vibes whatsoever..I’m amazed! Your shifting will be buttery smooth, throttle response is awesome, torque steer? What’s that? Amazing job, Corksport! You guys rock! This mount alleviated a problem I had where 1st to 2nd and 2nd to 3rd shifts were not going in when under heavy acceleration. The overall feeling of the car is tighter with a very miniscule increases in vibration inside the cab. Install was simple (45 min) I did have to do some very minor persuading with a small pry bar to get one of the holes to line up on the transmission side. I am very happy with this mount overall. Just got done installing this on Christmas Eve, Merry Christmas to me:) The install was extremely simple and quick and WOW what a freaking difference! There's definitely an increase in NVH but I actually enjoy it because it feels very RAW. Car feels super solid, throttle response is incredible and overall I'm extremely satisfied and blown away by the quality and performance! Corksport...now you guys are just showing off lol! Highly recommend! So glad I went with this mount, huge improvement over the stock rmm. My speed handles so much better now, definitely worth it. I also find the slight increased vibration a plus, obviously you're going to get that with a stiffer mount and I think it just makes the car more exciting. Blown away by the difference it made when running through the gears. I personally don't mind the extra noise/vibrations, which are minimal anyways. Smooth shifts, great take offs. Definitely recommend! more in the car drone sound from exhaust , but no more jolting back and forth, perfect shifts and slow take offs are so much smoother only took her for a small rip but instant night and day difference easy to install and the quality is awesome. Definitely an increase in vibration and noise, but the feel of the car under acceleration is just so much tighter. Well worth the trade off. Car feels much more solid. After having another company's mount in my sights, I decided to go with the CS Stage 2 one instead, and I am incredibly happy I did. I rode in a friends car with the same mount that I was going to get and it seemed a little too harsh for my liking. So the reduced NVH was definitely a selling point for me. Install was a breeze, especially compared to others that I have done or helped with. The two piece design DEFINITELY makes for an easy install. took me about 25 minutes from to point I jacked my car up. 10/10 from CS yet again. I just had it installed, and my first assessment is: WOW, AWESOME! On a very subjective scale (I have chronic pain and a very high pain threshold) from 1-10, 10 being totally unacceptable NVH: I give it +2 in NVH. There is some vibration at idle but is acceptable, it accelerates very smoothly and linear and the throttle response seems more positive. Just gave 4 star because I didn't have a chance to test drive yet. I had installed the first RMM that corksport had. I had the blue insert installed. When I removed the first corksport rmm, I was shocked to see that it had torn! I've done additional modifications and a custom tune since, so perhaps the insert tore afterwards. I was wondering why my torque steer was horrible! I'm glad this stage 2 rmm is now offered. If anyone has not done the RMM upgrade yet, just get this one instead. I think the first rmm from corksport might tear like mine did after upgrading to stage 2 (I might be an isolated case though so it's up to you). Installation is very easy. Just have a pry bar handy because the transmission/engine might shift a bit when removing the existing mount. I can't wait to go for a rip tomorrow! PS Love the subtle " Because torque steer..." etch on the mount. Great quality right out of the box. Very easy to install. The feel of this rmm compared to the other design of rmm is night and day!!! Highly recommend. The Older one is not as rigid and does not reposition the leverage point. This is a full mount replacement. 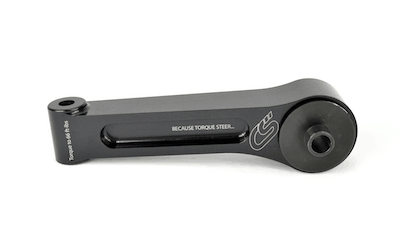 If you plan to make some power in your car, then the Stage II mount would be best for you. Hi, Is this product not so rigid for a daily car? I'm in stage1++. For the stage 2, i just must have the cat back. It is ok for daily driving. Hi, What about this product for automatic transmission? Is it unsuitable as you said for your older RMM? Mazda never made an automatic Mazdaspeed 3. This is a completely different mount design from the race mount we also offer. There are no shared components. What sort of difference is there vs. the older race mount in respect to NVH? NVH is very comparable. You may notice a bit more vibration at launch but very very suddle. Even though the new mount uses a 90 Duro bushing. 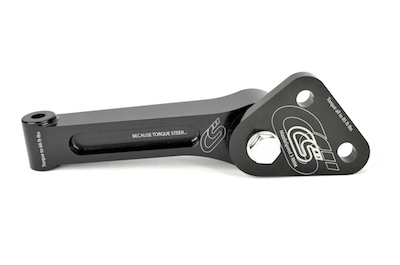 Upon comparison with product Axl-6-127-21, which fits 2004-09 mazda 3, I'm curious if this will fit my 2004 mazda 3. Or will the front part of the mount that attaches to the engine/transmission itself not line up with the bolt holes for the stock mount location? The front part that attaches to the transmission itself will not line up. Will this fit a 2004 Mazda 3 2.3 hatchback? No, this is Mazdaspeed specific. 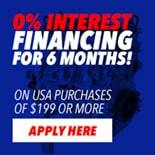 The Race RMM will work for your car.